Philadelphus is a large evergreen shrub that is usually grown for its abundant white fragranced flowers. The shrub gets its common name, Mock Orange because its flowers and scent are similar to an orange tree in blossom. In fact, the scent is sweeter and even more intense. This shrub can fill your garden with its heady perfume. All varieties of this shrub blossom profusely, most with double white flowers and yellow stamens. In mid to late summer the entire shrub will be covered with blooms. These blossoms are very attractive to bees and butterflies and so are a good choice if you wish to entice wildlife to your garden. Most varieties will flower from June to July, though some are a little later. This shrub is an easy to grow and carefree plant that requires little maintenance once established. The varieties vary in size, so this shrub can be useful in a range of situations from mixed borders or shrubberies, as specimen plants or even as an informal hedge. The more compact varieties can also be planted in containers around seating areas where you can enjoy their heavenly scent. This guide will help you to choose the right variety for your garden depending on your conditions and what you want from the plants. In addition, it includes advice on care, pruning, propagation and how to deal with any problems you may experience growing this shrub. There are many beautiful varieties of Philadelphus. Most are deciduous and all blossom profusely in mid to late summer. They range in size from dwarf varieties to giants, so there is a type to fit all garden sizes. Some are also suitable for planting in containers. This variety has an arching habit, especially in mid-summer when it is laden with pure white, highly-scented flowers. It’s spread can be greater than its height, reaching 2 metres (7 feet). This variety has large, white, cup-shaped flowers held on arching stems. These flowers are sometimes tinged pink as they age. It is quite a large shrub reaching a height of around 2.5 metres (8 feet). This beautiful variety produces large single flowers that are white with orange-tinged petals and a hint of lilac around the stamens. It is a hardy shrub with an upright habit and graceful arching branches. As with most varieties, it will tolerate almost all conditions and grows to a height of approximately 1.5 metres (5 feet). However, its spread can be as much as 2.5 metres (8 feet). This variety has bright yellow spring foliage that matures to light green. It has abundant white flowers with a yellow centre. The scent is all you expect from a Mock Orange. It reaches a height of 1 metre (3 feet) but copes with being pruned to keep it smaller. It is very hardy and tolerant of coastal conditions. It also accepting of quite a lot of shade making it ideal for a woodland garden. Philadelphus Innocence is a large erect shrub with arching branches, laden with semi-double white flowers. It is highly scented and attractive to butterflies and bees. It reaches a height of 3 metres (10 feet) and a spread of approximately 2 metres (6-7 feet). This variety is coveted for its exceptional fragrance. It is also prized for its white, single flowers with yellow stamens that grow in clusters of three or five. It is a more compact variety reaching 1.5 metres (5 feet) and it doesn’t mind being pruned, so can be useful for a smaller space. It will also do well in a large container. This dwarf variety reaches a height of only 80 cm (31 inches) making it ideal for the smaller garden or for growing in a container. It produces an abundance of double creamy-white flowers and can tolerate most conditions including coastal situations. This shrub stays compact and neat and will rarely need any pruning. 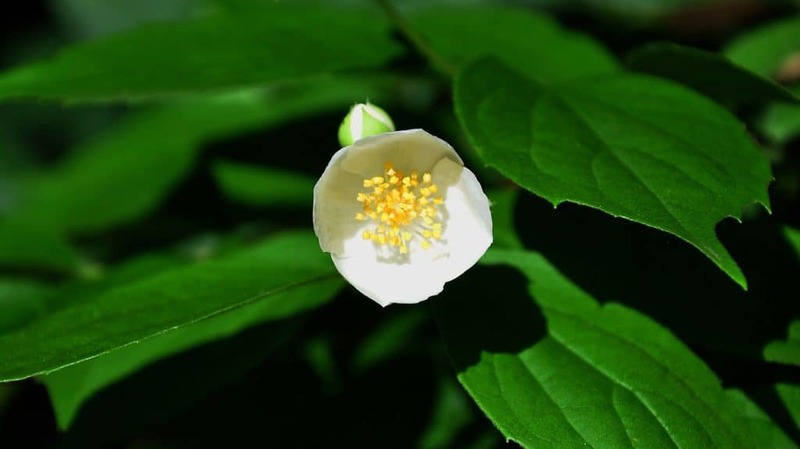 Philadelphus Microphylluss is often known as Little Leaf Mock Orange because of its small leaves. It’s a compact variety with upright growth, reaching a height of 1 metre (3 feet) and a similar spread. It also features attractive bark. This variety is a large evergreen shrub that can reach heights of 3 metres (10 feet), and a spread of 2.5 metres (8 feet) so it will need plenty of room to grow. You may also want to prune it to keep it the right size for its position. It features highly scented, pure white, double flowers in abundance during early summer. This is a very hardy variety and will also tolerate wind, and salt making it ideal for coastal gardens. Philadelphus are so easy to grow and so tolerant of most conditions that planting and maintaining one is simplicity itself. Pay attention to pruning times to get the most abundant summer blooms. Most Mock Orange varieties like full sun or partial shade. They will not do well and will not flower profusely if planted in deep shade. Philadelphus ‘Coronarius’ will tolerate more shade than most varieties. These shrubs will rarely need watering once established as they have very deep root systems. However, plants grown in containers, or in soil that is not deep, will need watering when the weather is dry. These shrubs can grow in most soils from heavy clay to light, sandy soils or chalk. They are happy in acid or alkaline soil and they can also tolerate salt. They have a very deep root system and so are unaffected by dry weather. They will, however, need to be kept watered for their first year until the roots are well established. An application of slow-release shrub fertiliser in spring will keep your shrub in tip-top condition and encourage plenty of growth and flowers. Occasionally, in very poor soil, an extra dose of fertilizer in mid-summer is required. Pot grown plants will need more regular feeding. Choose a position in full sun or partial shade. Dig a hole twice the size of the root ball of your new plant. You can apply some blood, fish and bone to the hole to give your shrub a great start. Backfill the hole and firm in the soil to remove air pockets. Water in well to help the soil settle in around the roots. If planting in a container, choose a medium to large pot depending on the variety chosen. Make sure you choose one of the more compact or dwarf varieties for best results. Container grown plants will need to be kept well-watered, especially in dry conditions. They will also benefit from an application of fertiliser such as blood, fish and bone, three times a year. 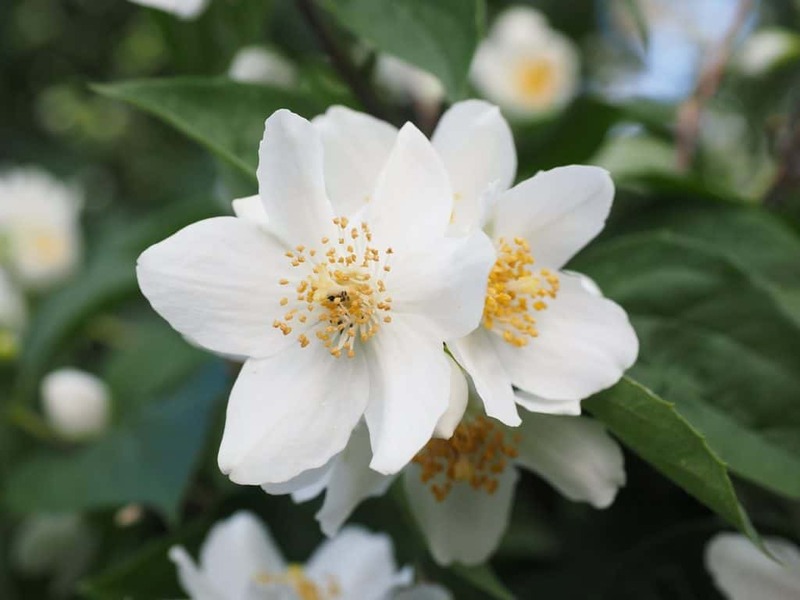 Mock Orange is very self-sufficient and will need little in the way of care and maintenance. Occasionally they may need extra water if the weather is exceptionally dry, however, they usually manage just fine even in a drought. They usually only require an annual feed with a slow-release shrub fertilizer in early spring. Your Philadelphus should be moved to a larger container if its roots become overcrowded. Planting in a new, slightly larger pot will give the roots more space and allow for more soil around the roots which will help keep them moist and provide them with nutrients. These beautifully scented shrubs look wonderful as part of a relaxed planting scheme or cottage garden. The different sizes of the varieties mean there is a Philadelphus suitable for most situations including shrubberies and mixed borders. You might like to plant yours with other highly fragranced plants such as Lilac, Honeysuckle or Jasmine to create a wonderful scented garden. This can be particularly nice near the house or a seating area where you can enjoy the heady scents. Of course, they make a great addition to a white garden, but they also look good with blue flowering shrubs such as Ceanothus. In fact, their white blossoms go well with most colour combinations from cool blues and violets to hot reds and yellows. Most Philadelphus varieties benefit from a good annual prune. The key factor in pruning this shrub is timing. Pruning too early or too late will result in a failure to flower the following year. However, it is quite simple to prune this plant correctly and encourage an abundance of blossoms year after year. Once the shrub has finished flowering you should cut back all the stems that have just flowered. You should prune them back to around one third in length. The new shoots that grow from these cut back stems will provide the flowering shoots for the following year. In addition to pruning back flowered stems, you should also cut back around one in three of the old stems. These should be cut back to a few inches above the ground. This hard pruning will encourage new basal growths which will provide an excellent framework for future year’s growth. By doing this you will keep your shrub looking fresh and vibrant and not end up with a straggly overgrown shrub. Philadelphus can easily be propagated by softwood cuttings in spring. If the weather has been exceptionally dry, water your parent plant a few days before taking cuttings. Cuttings should be taken in the morning when the plant is full of sap. Prepare a four-inch pot for each or your cuttings. Fill the pots to half an inch from the top with potting compost and make a slim hole with a pencil or stick. Choose healthy stems without any buds or flowers, then, with a clean sharp knife, or secateurs, cut off a stem about 4 inches long. Remove the lower third of the leaves from the stem, dip the stem in rooting hormone powder and put into the prepared holes so that about one third of the stem is beneath soil level. Firm the soil around the stems and mist the pots with water. Cover the pots with a plastic bag secured with an elastic band and place them in a sheltered spot out of direct sunlight. Alternatively, they can be placed in a greenhouse or cold frame. Once the cutting is putting on new growth you can remove the bag. Keep the plants in a sheltered location and pot on if necessary. You can plant them out once the roots are well established. Philadelphus rare rarely troubled with pests and diseases and even when affected they do not come to much harm. There are a couple of things to watch out for, however, to keep your plant in the best of health. Aphids are the most likely pest to infest your Philadelphus. These sap-sucking insects can feed on the foliage stems and flowers of your plant. Common varieties of aphids include blackfly and greenfly. If you plant has an aphid infestation you will see the insects on the stems and undersides of the leaves. They can cause poor and distorted growth and leave a sticky substance called honeydew on the leaves and stems. They are most active in spring and summer. While aphids are unlikely to kill your plant, they can make photosynthesis more difficult because of the damage to leaves, this can gradually weaken the plant. Encouraging the natural predators of aphids such as ladybirds, hoverfly larvae, lacewing larvae and parasitic wasps can help to keep them at bay, however often an infestation can build up before these insects are around in high numbers. You may want to scrape off the bugs with your fingers or squirt them off with a steady jet of water. Alternatively, you may want to spray your shrub with a pesticide to remove the aphids. However, these methods are this is only really feasible on smaller plants. On very large trees there is little you can do to control the problem, but luckily these big, mature shrubs will manage pretty well despite these parasites. If your plant becomes affected with powdery mildew you will see white, powdery-looking patches of the fungus spreading across the leaves. This disease can lead to stunted and distorted leaves affecting the plant’s ability to photosynthesize. You should remove affected growth immediately. Looking after your plant, in general, can help improve its health. Water it if the weather has been dry, but at the roots and not all over the leaves. Watering in the morning allow the moisture to evaporate. Ensure there is enough air circulation around the plant by cutting back other plants around it or thinning the shrub itself. Remove all weeds from around the plant to encourage good air circulation, too. Mulching your plant can help prevent spores from re-infecting the plant. Keep the mulch a few inches away from the base of the shrub to prevent rotting. All debris from the plant should be removed and put in the rubbish or burnt rather than composted to prevent re-infection. There are also many fungicides that can be used against powdery mildew. Q My Philadelphus has yellow leaves and doesn’t seem to be growing well. What can I do to perk it up? While Philadelphus usually needs little maintenance due to its deep root system and hardy nature, it can under some circumstances suffer a lack of nutrients, which I think may be the case here. If your shrub is planted in shallow or very poor soil, it can benefit from an extra dose of fertiliser in mid-summer in addition to the usual dose in spring. Use a well-balanced fertiliser suitable for shrubs and trees and apply at a rate of 1 tablespoon per foot of plant height. Avoid fertilising your shrub later than July as the new growth encouraged by the fresh nutrients will not get a chance to harden off before winter.